On December 17, 2009, First Counselor of the Embassy Mrs. Snezana Jankovic gave lecture on Serbia to the students of the International School of the Sacred Heart (ISSH) in Tokyo. The students were introduced with the history of Serbia, genesis of the conflicts in the territory of the former Yugoslavia, as well as with the Serbian position regarding the unilaterally proclaimed secession of Kosovo and Metohija and with the integration process of the Western Balkan region in the European Union. Japanese Centre of the International Theatre Institute/UNESCO presented a play "Tracks" ("Šine") by Milena Marković, as a part of the stage-reading project "Contemporary Theatre in Balkan Peninsula – Theatre in Trouble Spot". The event, planned to mark "Japan-Danube Friendship Year 2009", has been supported by Agency for Cultural Affairs of Japanese Government and our Embassy, and was held at the Theatre Iwato in Tokyo. On the occasion of the successful opening of first Serbian booth at the traditional Autumn Harvest Fair in Yokohama this autumn, Ambassador Mrkic and his wife hosted a "Thank You" dinner for our friends and benefactors, who were involved in the organization of this event. Japanese guests - Mr. Kenzo Yoneda, Chairman of Board of Japan-Serbia Association, Director of "Toagas" Mr. Toshio Tanabe with his wife and son, member of the Yokohama Autumn Harvest Fair Organizing Committee Mr. Tsuruta with his wife, and Mr. Mori, Mr. Tanabe's associate - were served with hand made Serbian specialities, wine and spirits. For details about the Autumn Harvest Fair in Yokohama, please see the following link. ACC organization held their annual Christmas Charity Fair in Tokyo, selling the hand made products by internally displaced women from Serbian province of Kosovo and Metohija. According to ACC Director Ms. Matsunaga, this year's Fair was visited by many people. Serbian artifacts also drew a lot of attention, which resulted in attracting a valuable support and new collaboration with other Japanese charity and non-profit organizations. The representatives of ACC are planning another trip to Serbia in February next year to continue with their programs of support for refugees, elderly and orphans in Belgrade and other cities. Ms. Etsuko Iwata and Ms. Ikuyo Azuma from Kanagawa TV, together with the member of the Yokohama Autumn Harvest Fair Organizing Committee, Mr. Tsuruta, visited our Embassy to discuss about current and future collaboration in the media promotion of Serbia. Kanagawa TV, which covers a wide area of Kanagawa Prefecture with around 10 million viewers, was a major broadcaster at the Autumn Harvest Fair in Yokohama. The popularity of Serbian booth, the only foreign exhibitor at the Fair, grew also as a result of Kanagawa TV's support, which broadcasted the performance of Serbian national dancers from Ensemble "Kolo" at the main stage. Japanese company "Sedna Corporation" interviewed Ambassador Mrkic for its veb content "F-commu", which focuses on the talk about the country and profession to which the guest belongs. This project includes series of inteviews with the heads of diplomatic missions in Tokyo. It is intended to introduce foreign cultures and various careers of their guests to the younger generations in Japan. To see the videocast of the interview (by Quick Time), please click on the following links. To download the software of Quick Time for free http://www.apple.com/quicktime/download/. 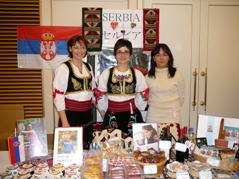 Once again, Serbian Embassy participated in this year's bigest annual International Charity Fair and Ikebana Exhibition, held in Tokyo Prince Hotel on December 01. In this event, supported by its Honorary President H.I.H. 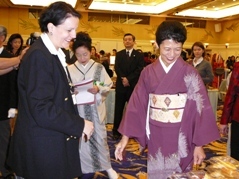 Princess Takamado, many foreign countries presented their products and delicacies. Our booth was visited by many guests, which showed a lot of interest in our country, its beauties and various products, that were on sale. During her visit to our booth, H.I.H. Princess Takamado showed her interest in some of Serbian traditional food. Mrs. Ivona Mrkić, the wife of the Ambassador, presented to H.I.H. Princess Takamado the postal stamps, issued on the occasion of Emperor's 74th birthday and of marking 125th anniversary of bilateral diplomatic correspondance between King of Serbia, Milan I Obrenović, and the Emperor of Japan. The event has been widely reported in the press and TV channels. After succesfull visit of tourism representatives from Japan to Serbia, Japanese Association of Travel Agents (JATA) decided to organize for their members a second tour across Danube countries. 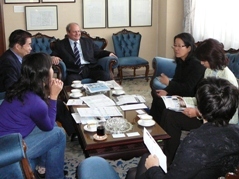 Tourism Agency of Serbia was the main host of their stay. In Belgrade, a seminar for Serbian travel agents and other representatives from tourism sector was organized, in the course of which Japanese guests had the opportunity to introduce their know-how and give valuable advices aiming to increase the number of Japanese tourists in Serbia. In a joint organization of Japanese External Trade Organization (JETRO), SIEPA, Embassy of Japan in Belgrade and our Embassy, a delegation of JETRO and Japanese companies’ representatives visited Serbia to find out more about the business environment and investment opportunities. On this occasion, the Embassy of Japan in Serbia hosted the seminar on foreign investment climate in Serbia with speakers, such as Deputy Prime Minister Mr. Bozidar Djelic and representatives from SIEPA, City of Belgrade and Foreign Investors Council. Japanese delegation also visited several factories around Serbia and met with their management. Our Embassy parcitipated in organization and preparation of the hand made products sale at the Christmas Charity fair, hosted by International Ladies Benevolent Society in Tokyo. This society is known for its world wide support of the children and socially groups. Some of its representatives has already visited and extended help for the Serbian community in Kosovo and Metohia province. 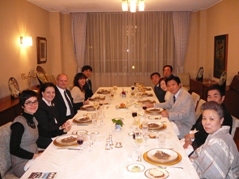 On the invitiation by Ms. Akiko Santo, Vice President of the House of Councillors, extended to one number of spouses of the Diplomatic Chiefs of Missions in Tokyo, Mrs. Ivona Mrkić, wife of the Ambassador, participated at the luncheon and cultural exchange event at the Official Residence of Vice President Ms. Santo. The guests talked about their countries' cultural heritage, customs and differences, and were presented with the "temari" ball by their host. We have learned, with deep sorrow, that His Holiness Mr. Pavle, the Patriarch of the Serbian Orthodox Church, has passed away on Sunday, the 15th of November in Belgrade, at the age of 95. Serbian people lost its spiritual leader, whose life testified the highest moral values and philantropy. His Holiness Mr. Pavle was the 44th Head of the Serbian Orthodox Church, who held the position for almost 19 years. Our Embassy opened the Book of Condolences for signing on Wednesday, November 18th, and Thursday, November 19th, 2009. On the occasion of the opening of the 35th annual exhibition of Japanese Naive Art Society, held on the Culture Day in Tokyo Metropolitan Art Musem, ambassador Mrkić and Head of Cultural Section Ms. Kovač participated in the event, along with two Vice Presidents of Japan - Serbia Friendship Society, Ms. Hamada and Prof. Shiba, and some other members of the Board of Directors. Ambassador Mrkić gave a speech and presented an "Award of the Embassy of the Republic of Serbia in Japan" to Ms. Eiko Nagata. This is the first time our Embassy was honored to give a prize to the Japanese naive artist, while other awards are given by various institutions (MEXT, Tokyo Government, museums…) and companies like JAL. Earlier that day Prof.Shiba held a lecture on Naive Art in Serbia and the representatives of Japanese Naive Art Society organized a presentation about their recent trip and exhibitions in Serbia. 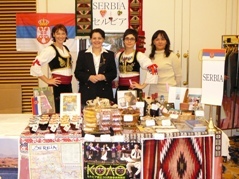 This year Serbia participated for the first time at the annual "Autumn Harvest Fair" in the center of Yokohama as the only foreign exhibitor among 100 participants from Japan. This was a great opportunity to promote delicious food products and wines from our country, as well as culture and tourism. Our presence was strongly supported by Prof. Kenzo Yoneda, President of the Board of Directors of Japan - Serbia Friendship Association, and his colleagues Mr. Toshio Tanabe, President of "Toagas Co." as well as by Mr. Riichiro Tsuruta. Ambassador Mrkić, his family and other Embassy's colleagues with their families participated in the event and worked, alongside Serbian volunteers, at the stand to promote our country. Ambassador and First Counsellor Ms. Janković also greeted the visitors. The dance and singing perfomances of Ms. Anđelka Petrović and Ms. Milica Miladinović from Serbian National Folk Ensemble "Kolo" attracted a great number of visitors to our booth, and was even broadcasted on the regional TV Kanagawa. Prefectural Governor Mr. Shigefumi Matsuzawa also came to Serbian stand. The visitors had also an opportunity to see a demonstration of the invention by Serbian scientist Nikola Tesla, "Colombus Egg". Ms. Anđelka Petrović and Ms. Milica Miladinović from Serbian National Folk Ensemble "Kolo"
Serbian Foreign Minister Mr. Vuk Jeremić visited Tokyo on the invitation of the Minister of Foreign Affairs of Japan, Mr. Katsuya Okada, from October 29th to 30th, 2009. 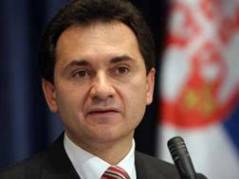 It was the first official visit to Japan of Foreign Minister of the Republic of Serbia, which marked the significant moment in our 127 years long bilateral relations. During his stay, Foreign Minister Mr. Jeremić had a range of meetings aimed at enhancing bilateral political and economic cooperation between our two countries. Apart from official talks and dinner with Foreign Minister H.E. Mr. Katsuya Okada, program of the visit included talks with President of JICA Mrs. Sadako Ogata, signing the Joint Statement with Deputy President of JBIC Mr. Yoshiko Morita, receptions by Upper House President H.E. Mr. Satsuki Eda and Lower House Speaker H.E. Mr. Takahiro Yokomichi and meeting with the Honorary Consul General of Serbia in Osaka Mr. Naohide Ueyama. Serbian translators awarded for the work on "Kojiki"
The Japanese Society of Translation presented an award to the team of translators from Faculty of Philology, University of Belgrade, headed by well-known translator Mr. Hiroshi Yamasaki Vukelić, for their translation of the representative work of Japanese literature "Kojiki". Mr. Yamasaki Vukelić, who came from Serbia for this occasion, received the award and made a speech during the award ceremony in Tokyo. Japanese Photographer Haruo Matsuya, who visited Serbia several times, exhibited his impressions on Serbia in the photos and videos at Tokyo's "Up Field Gallery". Head of Cultural Section Ms. Kovač greeted the guests at the opening, expressing gratitude for his impressive works which celebrate Serbian people and its historical heritage. The work by outstanding Serbian writer and member of the Academy of Serbia Mr. Ljubomir Simović was performed in Tokyo's "Theatre Iwato" by the Japanese theater company "Black Tent". This is the very first time that a theatrical troupe from Japan presented such a significant and awarded drama, which left an imprint in the contemporary theatre in Serbia. For this purpose the whole text of the play was translated into Japanese. The play was directed by Mr. Prosper Diss, French theater director. The project was supported by Japan Foundation and our Embassy. We are delighted that, after touring in various parts of the world, &"The Šopalović Travelling Theater" has reached Tokyo as well. 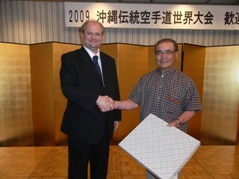 Mr. Božidar Đelić, Deputy Prime Minister and Minister of Science and Technology of the Republic of Serbia, participated in the annual Science and Technology in Society Forum, held on 4-6 October, 2009 in Kyoto. 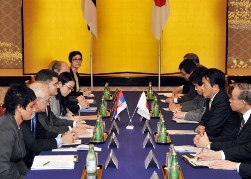 During the Forum, Deputy Prime Minister Mr. Đelić anSerbian Deputy Prime Minister and Minister of Science Mr. Božidar Đelić participated in the Science and Technology Forumd State Secretary Ms. Snežana Pajović met with the representatives of MEXT and AIST from Japan, as well as numerous dignitaries from other countries, participating in the event. In the final of the Pan Pacific Open, 24-year-old 7th-seeded #8 (former #1) Jelena Jankovic won the second place. In the match with Maria Sharapova, Jelena retired due to a right arm injury winning the second prize. Ana Ivanovic finished at 11th place. 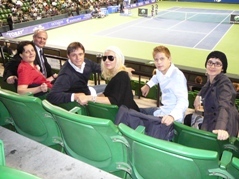 Ambassador I. Mrkić and Serbian football coach of Nagoya Grampus Eight Team, Mr. Dragan Stojković Piksi, attended the tournament with their families and colleagues, cheering for our best tennis players. Following the decision of the Government of Serbia to mark 130 years since the birth of one of the world's most significant scientists and geophysicists, Milutin Milanković, a Serbian, the Embassy organized a reception on September 24 in Tokyo, remembering his astonishing achievements. In addressing the guests, Ambassador Mrkić underlined the importance of Milanković’s work, whose contributions to the world of science are considered as indispensable. Representatives of our friendship associations, Japanese academic and scientific circles, our students and other guests had the opportunity to enjoy the presentation on Milanković's life and research, followed by coctail and musical performance. On this occasion, Ms. Kovač, Head of the Embassy's Cultural Section, gave the interview for Serbian TV "F Magazine" in which she talked about the historical links between our two countries and bilateral cultural cooperation. We were happy to greet in our premises Mr. Tetsuo Masunaga from "Folklore Report" and Serbian delegation from state traditional dance ansamble "Kolo" (www.kolo.rs), headed by Director Radojica Kuzmanović. Their visit is of preparatory nature, ahead of the Japanese tour of Serbian most famous "Kolo" dance group in 2010. We learned more about the ongoing preparations and program of the concerts, which will be organized in February and March 2009 in various cities throughout the country. The Embassy will continue with its support to this important event and invites all our friends, colleagues and interested parties to the "Kolo" performances next year. For the fourth consecutive year Serbia was participating at the JATA World Tourism Congress & Travel Fair at Tokyo Big Sight (http://www.jata-wtf.com), which is one of the biggest international fairs in Asia. Ambassador Mrkić and Third Secretary Ms. Kovač attended the opening reception on the first day, along with the great number of Japanese tourism institutions and agencies, media and diplomatic corps. The representatives of the Tourism Organization of Serbia (TOS) and of the Tourism Organization of Belgrade (TOB) introduced diverse touristic offers from Serbia, focusing on the tourist attractions in the vicinity of Danube river. This year our booth joined other European countries around Danube river, as the initiative supported and promoted by the main organizer JATA. TOS representative, Mr. Rolović, also had the opportunity to introduce the tourist strategy and priorities of Serbia at the seminar on Danube countries on September 18th, underlining its positive effects and the increase in number of Japanese tourists to our country. Ms. Vesna Džagić, Head of Restrictive Agreements Assesment Department of the the Commission for Protection of Competition of the Republic of Serbia, is participating in JICA Seminar on Cometition Law and Policy, from August 19 to September 19, 2009. This course is a part of technical assistance of Japan to Serbia, held in Osaka and Tokyo. During her stay in Tokyo, Ms. Džagić met with Ambassador Mrkić and Third Secretary Ms. Kovač to share some of her experiences and opinions on the cooperation with Japan. Pursuant to the current Serbian Law on Protection of Competition (came into force on September 23, 2006), Commission for Protection of Competition has been set up as an independent and autonomous authority in the capacity of legal entity, located in Beograd and responsible for its activities to the National Parliament. For more information about Serbian Competition Commission, please click here. We had a pleasure to learn that Ms. Mila Vilotijević, soprano opera singer from Serbia, came to Japan to perform this September in two famous operas by renowned Italian composer Giuseppe Verdi: Aida and Don Carlos. Ms. Vilotijević is a member of La Scala from Milan – one of the most distinguished opera houses in the world. 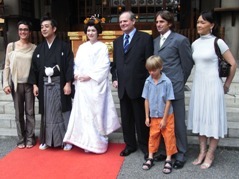 Ms. Vilotijević had already been introduced to Japan during her previous tours here. This time she also visited our Embassy. Ambassador Mrkic and Third Secretary Kovac met with Prof. Katsuhiko Shirai, President of Waseda University, Prof. Masataka Ota, Vice President, and their colleagues from University's International Affairs Division Director Shinichi Adachi and Mr. Tsutomu Harada. They exchange views on the possibilities of future cooperation regarding the high level official's visit expected this year. They also reaffirmed the wish to continue the on-going academic cooperation and student exchange between Waseda University and University of Belgrade, established in 2005. 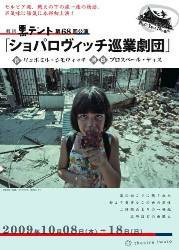 New movie by renowned film director, Emir Kusturica, whose previous work "Promise me this" ("Zavet" in Serbian) was released last year in cinemas in Tokyo and across Japan, will be coming to cinema in Shibuya and then to dozen more in the country in December 2009. The preview of the movie, portraying the famous Argentinian football player Diego Maradona, was shown on August 31 in IMAGICA Center in Tokyo. Ambassador Mrkic and Head of Cultural Affairs Section Ms. Kovac attended the preview and met with the representatives of film distribution company and others involved in this project. 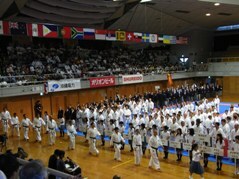 Seven members of Serbian team, headed by Mr. Vladimir Popovic, took part in this year's tournament in the traditional Okinawa sport of karate-do, among 43 countries and over 900 other participants. In this event, held in Okinawa's capital Naha, Okinawa karate-do master from Serbia, Mr. Nebojsa Baba, was placed among 16 best in the world. Ambassador Mrkic with his colleague Ms. Kovac, who were invited to support the tournament, met with Serbian karate-do players and congratulated them for the achievements and zealous work. They were also guests at the Welcome party on August 15 organized by Okinawa karate-do Association, which has been nurturing a long relation and friendship with Mr. Popovic and our country. Ambassador Mrkić addressed the gathering. The speeches by the President of the Association Mr. Nobuhide Asato and Prof. Shigeru Takamiyagi, the Chairman of the Board of Directors of Society for the Advancement of the Traditional Okinawan karate, were very moving and full of warm emotions extended to Serbia and its people. 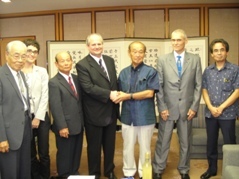 Ambassador and Mr. Popovic, together with their colleagues and Okinawa karate-do Association representatives, had the opportunity to meet on separate occasions with H.E. Mr. Hirokazu Nakaima, Governor of Okinawa Prefecture, and Mr. Tomokazu Takamine, President of daily paper "Ryukyu Shimpo". Nagasaki this year too commemorated its victims (150.000 altogether), who died in the atomic bombing on August 9th, 1945. The main guest speaker was H.E. Miguel d'Escoto Brockmann, the President of the United Nations General Assembly. The mayors coming from cities from all over the world, together with many diplomatic representatives, encountered the representatives of the survivors (hibakusha) and visited the museum devoted to those who lost their lives in the attack and use of this unhumane weapon. 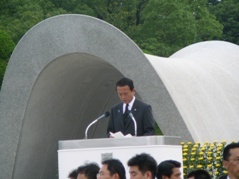 Ambassador Mrkic participated in the memorial ceremony devoted to the victims of the atomic bomb, an abhorrent weapon used for the first time against many civilians, who perished instantly or were later affected by the radiation. The whole leadership of Japan, headed by the Prime Minister Taro Aso, and great number of guests and representatives of diplomatic corps were also present at the ceremony. As always, the whole event passed in a dignified atmosphere and emotional remembrance of those who lost their lives. On July 23, the Honorary Consulate General of the Republic of Serbia in Osaka, with support of our Embassy, had a pleasure to welcome a group of students from Hiroshima. Honorary Consul General, Mr. Naohide Ueyama and the Head of the Serbian Embassy's Culture and Press Section, Aleksandra Kovač, talked about Serbian history, its cultural heritage and natural beauties and engaged in lively discussion with students about various topics regarding environmental protection, education, lifestyle and sport in Serbia. 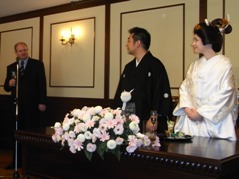 On July 12 in Tokyo, the Embassy was celebrating the wedding of our colleague Mrs. Tijana Zdravkovic to Mr. Keigo Nagato. Isn’t this event the vivid confirmation of the closeness and mutual affection between Serbian and Japanese nationals? 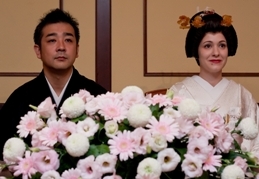 We wish Tijana and Keigo the very best in their matrimony, plenty of children and above all good health and happiness! 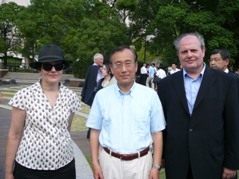 Ms. Danijela Bozanic, official of the Ministry of Environmental Protection of the Republic of Serbia, took part in the Seminar on Cool Earth Partnership in Osaka and Tokyo, organized by the Japan International Cooperation Agency (JICA) in July 2009. During her stay in Tokyo, Ms. Bozanic had the opportunity to visit us and talk about current growing cooperation and projects between Japan and Serbia in the environmental area. 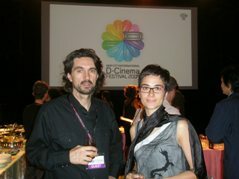 Darko Lungulov, remarkable Serbian filmmaker, was invited to this year's SKIP City International D-Cinema Festival in Saitama to present his awarded and praised new movie "Here and there" (2009). The international film festival is held from July 10-20 in beautiful cinema complex (http://www.skipcity-dcf.jp), attracting short and feature movies from around the world to compete for generous awards. The movie will be shown on July 11th and 17th in the same complex in Saitama. 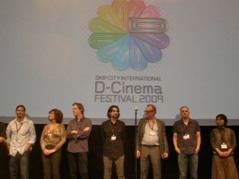 For summary, trailer and recent news about the movie, please visit http://hereandtherethemovie.com/ and http://www.skipcity-dcf.jp/en/program/feature/#f01.